We are very excited to announce our newest customer service initiative: the CUESA Market Ambassador program. Based out of the Info Kiosk in the back plaza, the Market Ambassador is like a roving concierge, available to answer your questions about where sellers are located, what’s in the market, parking, programs, culinary tips, and more! On Saturday, September 28, our Market Ambassador is owner/co-founder of Acme Bread Company and CUESA Board Member Steve Sullivan. Acme was one of the original vendors at the Ferry Plaza Farmers Market, and its freshly baked loaves, hand-formed using organic wheat flour, have been a fixture ever since. 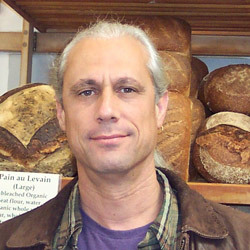 Steve will be in the back plaza from 9:30 to 11:30 am to answer your farmers market and bread questions. Meet Steve. CUESA: When did you join the CUESA board and what projects have you been working on at CUESA? Steve: Last May. I’m just getting oriented. I’m on the Market Policy committee, which aims to improve the way that the market works for sellers and buyers and the whole city. CUESA: What made you want to join the CUESA board? Steve: This is a wonderful market. Our company has been privileged to be a part of it since the very beginning. So if I can help with whatever it takes to keep it going and improving I’d like to do so. CUESA: What have you learned during your board tenure? Steve: So far I have mainly learned what a great, varied, and committed group the CUESA board is. Steve: My parents, my grandparents, and California. CUESA: What do you do when you aren’t conducting CUESA board business? Steve: The same things as everyone else: Work, cook, eat, read, play music, exercise, housework. I’m learning to be a grandfather now. CUESA: What is your favorite part about being on the CUESA board? Steve: The discussion and problem-solving processes—both electronic and face-to-face—are respectful and coherent.